A Brooklyn teenager feels his only chance to succeed is as the king of the disco floor, as his carefree weekend dancing helps him to forget the reality of his bleak life. As this represents my fourth review of 1977’s Saturday Night Fever, I’ll eschew my full discussion of the film. If you want to check out my detailed thoughts, please click here. Suffice it to say that after 40 years, it offers a fairly timeless flick that still holds up well despite its many period elements. The main appeal of this 2017 Blu-ray comes from the fact that this package includes both the film’s 1977 theatrical version (1:59:02) – which I discuss in the link above – and a new Director’s Cut (2:02:15). What does that extra three minutes, 13 seconds give to us? The DC adds three sequences, and the first comes at the 28:10 mark: Tony gets out of his friend’s car and stares wistfully at the Brooklyn Bridge. This sequence first came out as part of a TV version. The second extra snippet shows up at 1:31:45. Previously offered as a deleted scene on the Blu-ray and DVD versions, this one lets us know that Tony’s father goes back to work after a long layoff. Finally, the third extension appears at 1:54:28. After an all-night sojourn on the subway, Tony stops at Stephanie’s apartment to plead with her. In the theatrical version, Tony just knocks on her door, but here, he gets on the intercom to persuade her to buzz him into the building. Like the second clip, this one also popped up on the DVD and Blu-ray as a deleted scene. Do any of these additions make a difference in the movie? Not really. The clip with Tony’s dad offers the only real “new information”, and I guess our knowledge that Mr. Manero can now support the family makes it easier for us to accept it when Tony strikes out on his own. In the theatrical version, it might seem like Tony abandons his borderline destitute family, so our knowledge that Mr. Manero can now support the clan eliminates that possibility. That said, I doubt many people – if anyone – ever viewed Tony as a heartless cad without the knowledge of his father’s renewed employment. The new clip is the definition of “deleted scene fodder”: interesting to see but not especially important. As for the other two, they don’t even live up to that standard. The Bridge scene lets us know that Tony now starts to dream of a life beyond Brooklyn, but we get enough material of that sort later in the flick that this tidbit lacks a need to be in the film. It’s a pretty dull bit. The apartment bit lacks real importance as well. Tony still has to beg Stephanie to let him in the door, so a second scene of this sort feels redundant. I guess it better demonstrates Stephanie’s anger at Tony – maybe it seems like she lets him in the apartment too easily – but like the segment with Mr. Manero, I doubt anyone ever thought Stephanie acted like a pushover in the theatrical rendition. All of this makes the Director’s Cut a mildly interesting variation and that’s about it. The added scenes don’t detract from or harm the film, but they don’t make it any better, either. Honestly, the inclusion of the Director’s Cut feels like little more than a sales gimmick, as the extended version of the film lacks real dramatic purpose. 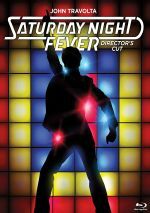 Saturday Night Fever appears in an aspect ratio of approximately 1.85:1 on this Blu-ray Disc. I felt very pleased with this strong new transfer. Sharpness appeared positive, as the picture came across as crisp and detailed throughout the film. I noticed no significant indications of softness or fuzziness during this distinct presentation. Jagged edges and moiré effects also caused no concerns, and I detected no signs of edge enhancement. As for print flaws, this was a clean image. It lacked specks, marks, nicks or other distractions. 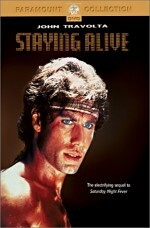 Fever provided a naturalistic palette, and the Blu-ray replicated the hues with good accuracy. The most notable potential concerns showed up during the nightclub scenes, as the colored lighting threatened to become somewhat thick. However, the tones looked nicely clear and realistic, and they showed no signs of noise or bleeding. Blacks appeared deep and rich, and shadow detail was concise. We got quite a few low-light shots, and these remained smooth and clear. Especially given the movie’s age and budget, I thought the flick looked terrific. The Dolby TrueHD 5.1 soundtrack of Saturday Night Fever also exceeded expectations I didn’t expect a very active soundfield, and what I heard seemed good considering those restrictions. The mix favored the forward channels and created a reasonably engaging sense of atmosphere. Music showed strong stereo delineation in the front, and effects popped up in logical locations. These blended together pretty well and created a good sense of place. The surrounds usually just reinforced the music and a sense of environment, but they did provide some occasional unique elements, such as the split-surround movement of a subway car. Audio quality appeared positive. Despite some occasionally dodgy looping, most of the lines seemed clear and distinct, and intelligibility never turned into a problem. I noticed no edginess or other concerns. Effects played a relatively modest part of the film, and they seemed fine. Overall these components presented clean and accurate material that lacked distortion or other issues. The all-important music seemed very good. The songs packed some nice bass thump and demonstrated nice range and vivacity. All in all, this became a pleasing and effective soundtrack. How did the 2017 “Director’s Cut” compare to the original Blu-ray from 2009? Audio showed greater range and clarity, and the mix also used the side/surround channels in a mildly more involving manner. This new 4K transfer showed improvements over the already-positive 2009 Blu-ray. The 2017 release demonstrated slightly superior delineation and looked cleaner and smoother overall. While I liked the 2009 disc, this one fared better in terms of picture and sound. The 2017 Blu-ray largely duplicates extras from the prior disc, though it adds a Director’s Cut. I already discussed that version in the body of my review, so if you missed it, look up a few paragraphs! Alongside the theatrical cut, we find an audio commentary from director John Badham. He offers a running, screen-specific track that looks at script and influences, cast and performances, music and its use in the film, sets, locations, technical elements, and many anecdotes from the shoot. At times, this commentary suffers from an excessive number of empty spots, as Badham often falls silent. However, the gaps don’t seem truly problematic – they pass fairly quickly – and the director provides enough useful information to make the spaces more forgivable. Badham proves to be a chatty and engaging participant. He seems honest and open about the production, and he tosses out lots of good notes. He includes many compelling anecdotes and gives us a nice overview of the film in this lively and likable chat. Catching the Fever breaks into five subdomains and lasts a total of 52 minutes, 39 seconds. It features Badham, producer Robert Stigwood, executive producer Kevin McCormick, costume designer Patrizia von Brandenstein, composer David Shire, former Studio 54 deejay Nicky Siano, the Bee Gees’ Barry and Robin Gibb, Last Night a Deejay Saved My Life authors Frank Broughton and Bill Brewster, Studio 54 publicist Joanne Horowitz, filmmaker Neil Meron, and actors Joseph Cali, Paul Pape, Denny Dillon, Barry Miller, Sam J. Coppola, Martin Shakar, Karen Lynn Gorney, Donna Pescow, and Monti Rock III. While the absence of Travolta disappoints, it doesn’t surprise. Even without him, “Fever” presents a lot of good information. After the fine primer offered by Badham during his commentary, “Fever” fleshes out various issues and supports the movie nicely. We get a good look at the flick and its era across these programs, though the final “Spotlight on Travolta” is a fluffy waste of time. Another featurette called Back to Bay Ridge runs nine minutes, one second, and includes a tour of the movie’s locations. We hear from Cali, Pescow, and location executive Lloyd Kaufman. At no point does this piece boast a lot of substance, but it includes a reasonable amount of info about the various locations. It’s also fun to see how these spots look today. For the next featurette, we get the nine-minute, 50-second Dance Like John Travolta with John Cassese. A pretty forgettable piece, Cassese and partner Jennelle Wax demonstrate some moves and then offer step-by-step directions. Maybe someone will find this useful, but it does nothing for me. Fever Challenge! goes for four minutes as it presents some dance moves. We’re supposed to follow these and see if we can emulate some steps from the film. It plays like a poor man’s version of those dance video games and doesn’t seem like much fun. A text commentary comes to us via the 70s Discopedia. 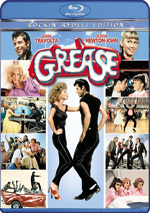 It presents notes about the film and those who made it, its impact on society in the Seventies and related efforts, music, dance sequences, various bits of minutiae about aspects of the flick. Text tracks can be hit or miss, but this one’s quite good. It throws in plenty of fun movie details along with nice facts to fit us into the late Seventies era. I like “Discopedia” a lot. Finally, we find one Deleted Scene: “Tony and Stephanie in the Car” (1:32). It shows Tony as he puts the moves on Stephanie outside her house. It offers material of mild interest but it’s not crucial. Note that the prior Blu-ray included two other deleted scenes: “Tony’s Dad Gets His Job Back” and “Tony at Stephanie’s Apartment”. Why don’t they reappear here? Because the “Director’s Cut” integrates them, so I guess the Blu-ray’s producers figured we didn’t need them on their own. Although Saturday Night Fever probably should come across as frightfully dated, the movie still seems compelling and engaging after 40 years. This slightly longer Director’s Cut does nothing to improve the movie, so don’t expect much from it. The Blu-ray offers excellent picture as well as very good audio and supplements. This 2017 disc becomes the best version of the film on the market, even if the new Director’s Cut feels like nothing more than a sales gimmick.